He had an enemy, the Donut Monster, who wanted the world to be made out of donuts. Crisps, on the other hand wanted the world to be made out of crisps. And then they decided that they wanted half the world to be made out of crisps and half the world to be made out of pepperoni pizza. Everyone in the village was afraid of Crisps and Pepper Roni because they were monsters, but the people in the village had never seen the donut monster so they were not afraid of him. Pepper Roni was afraid of the Donut Monster because he was trying to ruin his wish but also because a long time ago, both of their fathers had a fight, and Donut Monster’s Father had won. 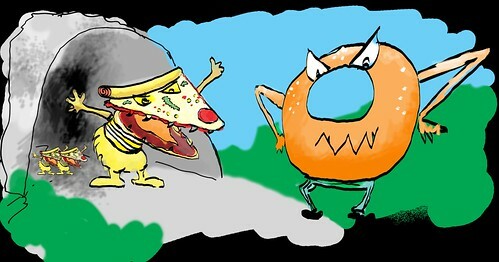 Donut Monster ate Pepper Roni’s Mother but not his Father, so he wanted to get revenge on the Donut Monster! Pepperoni Pizza came out of the cave with his mini pepperoni pizza army and his best friend Crisps, and they saw Donut Monster with his mini Donut zombie army. One of the donut zombies ate Pepper Roni’s arm off...but it grew back! 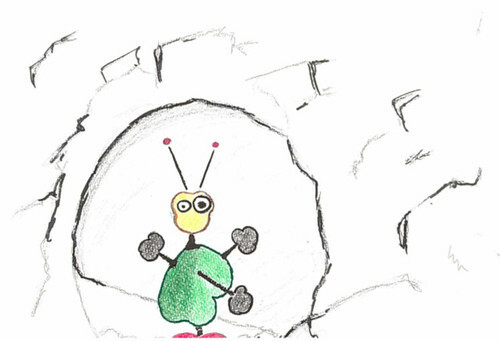 And Pepperoni Roni and Crisps ran up to a cliff, up towards one of the donut zombies to fight them, but then one of the donut zombies pushed Crisps off the cliff.